This page deals with some aspects of the early signalling on the Somerset & Dorset Joint Railway (S&DJR) which are not specific to any particular location on the railway, but relate to the general situation pre-1900. The S&DJR was formed originally in 1862 as the Somerset and Dorset Railway (S&DR) from the amalgamation of the existing Somerset Central Railway (SCR) and Dorset Central Railway (DCR). It became a 'Joint' line in 1875 when it was leased jointly by the London & South Western Railway (L&SWR) and the Midland Railway. The opening in 1874 by the S&DR of its 'Bath Extension' from Evercreech Junction to Bath has been taken as a convenient starting point for most of the information in RailWest about S&DJR signalling, as that event marked not only the expansion of the future S&DJR almost to its fullest extent, but also the first known introduction of 'proper' signalling in any quantity. Prior to 1874 records about any signalling on the SCR, DCR and S&DR are very scant, and it is probable that the actual installations were quite 'primitive' compared with those of later years. Certainly at that time the general attitude towards, and implementation of, railway signalling in Great Britain was very different to the situation that is familiar to those acquainted with the post-1900 era. The Board of Trade (BoT) came to play an important part eventually in the control and regulation of the railways in Great Britain, but for many years the BoT functioned only as an advisory body and their regulatory powers were granted piecemeal by various Acts of Parliament. However by 1874 the BoT had gained powers over new works on passenger lines and consequently the Bath Extension was signalled from the outset to a higher standard than would exist elsewhere on the S&DJR for several more years, where former SCR and DCR locations had more comprehensive interlocked equipment installed retrospectively during the late-1870s onwards. When the Bath Extension was opened in 1874 it is believed to have been the first portion of the S&DR to be equipped from the outset with proper interlocking of signals and points and with the passage of trains regulated by Absolute Block working. At that time the Station Agent (the S&DR name for the Station Master) had control of everything at his station; at many locations the signalling block instruments were placed in his office and worked by a telegraph clerk under his direction, while the signalman functioned merely as a 'pointsman' and operated the lever-frame as instructed. The separation of the signalman from the control of the block working contributed in part to the disaster at Foxcote (near Radstock) in 1876 and after that awful event the S&DJR began to relocate the block instruments into the signal-boxes. It is probable that the actual provision of signals on the SCR and DCR was relatively modest, and indeed may have been concentrated at the more important locations. The late Robin Atthill stated in his book "The Somerset and Dorset Railway" that the SCR used 'disc-and-crossbar' signals in line with Bristol & Exeter Railway practice, while the DCR used the 'revolving disc' type favoured by the L&SWR. This would seem to be a reasonable proposition, but the source of his information is unknown and it has not been possible to establish any further evidence. In contrast it should be noted that the 1864 S&DR Rule Book illustrates only the 'disc-and-crossbar' type of signal. Certainly there are references in later S&DJR records to 'disc-and-crossbar' signals at various places on the ex-DCR line and there is photographic evidence that one remained in use at Spetisbury until 1901. One possible theory is that the initial section of the DCR (from Wimborne to Blandford) did indeed use the L&SWR type of signal but that, when the SDR was formed, it was decided to adopt the 'disc-and-crossbar' type of signal already in use on the SCR as the common type across the SDR. The S&DJR Officers' Minutes for 21-October-1875 stated "...all disc-and-crossbar signals to be superseded by semaphores as renewal becomes necessary...". Whatever the earlier situation, it is believed that the Bath Extension was equipped throughout with semaphore signals and this may well have been their first large-scale use on the S&DJR. Click here for more detailed information about S&DJR signals. There are some references to 'signal-boxes' and 'signalmen' at various locations on the S&DR prior to 1874, but the nature and extent of such signal-boxes is unclear. It is quite possible that at least some of those signal-boxes may have been simply a small shelter to house the signalman and perhaps a telegraph instrument or similar equipment, but with any lever-frame being located outside. Although a few interlocked lever-frames may have existed on the S&DR before 1874, it is quite likely that initially the overall picture would have been of points and signals operated either by individual local levers, or from non-interlocked levers located on or near the platform (such as could be seen at Spetisbury). There are various references in later S&DJR records about the provision of new signal-boxes and the removal of disc-and-crossbar signals at former SCR and DCR locations in the late 1870s, which would seem to support the preceding comments about the earlier situation. Very little is known about the original signal-boxes on the Bath Extension, and indeed it has been suggested that in fact there were no 'boxes' as such at all, but simply lever-frames housed in the station buildings (which might account for their bay windows?). However that theory seems to be based purely on the fact that 'signal-boxes' are not marked specifically on the contemporary Ordnance Survey maps. A report from a preliminary BoT inspection in June 1874 includes the comment that "...the locking frames will require to be protected from the weather...", which would seem to suggest that certainly they were outside of any building at that time. However there are references to 'signal-boxes' in various S&DJR records and a report in the Bath Chronicle newspaper of 23-July-1874 says "...the levers are in covered boxes on the platform...", so it would seem fairly clear that some form of 'signal box' did exist at various locations on the Bath Extension by the time that the inaugural train ran on 20-July-1874. All the original signal-boxes were replaced during the doubling of the line in the 1880s and 1890s and unfortunately, with the exception of the signal-box at Radstock, no photographic record of them is known; it is possible that some of the structures did survive in other railway use but have not been identified in photographs simply because their origin is unknown. It is probable however that most of the original signal-boxes on the Bath Extension were little more than simple wooden huts covering the lever-frames; certainly they must have been very small, as it became necessary to extend them subsequently just in order to accommodate the block instruments. It is likely also that those original signal-boxes were placed on the platform close to the main station building, so that the signalman did not have to walk far between the lever-frame and the Station Agent's office. Certainly this was the case at Wellow, as is clear from evidence in the BoT Report on the 1876 Foxcote disaster, and some plans for 1886 show it then to have been at the Radstock end of the Up platform (see signal diagram); the lever-frame at Chilcompton was also in a similar location relative to the station building in 1878. One known exception was at Radstock, where the signal-box was sited adjacent to the level-crossing and photographic evidence shows that it was a large two-storey brick-built structure, and there is circumstantial evidence that the box at the original Bath Ticket Platform may also have been a small two-storey brick structure separate from the platform. There is photograph evidence also that the 'station' box at Evercreech Junction in the 1870s was a small two-storey brick structure adjacent to the level-crossing, which may perhaps have been constructed originally before the station became a junction, in which case one may speculate then whether similar examples might have existed elsewhere on the S&DR in earlier years. Nothing is known about the style of any early interlocked lever-frames which may have existed on the S&DR prior to 1874, although some tenuous circumstantial evidence might indicate that they were supplied by Saxby & Farmer (S&F). It is believed (from contemporary reports) that S&F lever-frames were installed in the original signal-boxes on the Bath Extension but, with the possible exception of Binegar (where the S&F frame appears to have been retained and then extended in later years), these all disappeared as the signal-boxes were replaced during the later doubling work. Apart from Binegar all those replacement signal-boxes were equipped with frames of the Stevens & Sons 'direct tappet' type and it would appear that the same type was used in most, if not all, of the subsequent work elsewhere on the S&DJR. After 1874 the S&DJR began to install many more signal-boxes in conjunction with various new passing-loops and the work accelerated with the programme of doubling the line, so that by the late 1880s the situation looked much like that of the post-1900 period (although not necessarily with the same signal-box structures). Many stations on the DCR and SCR would have been very basic locations originally with just a platform on the single-line (eg Spetisbury) and possibly with an adjacent level-crossing (eg Edington Road) or a siding (eg Ashcott); in such cases it is probable that any signalling would have comprised little more than one or two 'disc-and-crossbar' signals. Similar 'basic' stations appeared later on the Bath Extension, such as Midford and Masbury, but with the provision of semaphore signals. At that time it was a BoT requirement that passenger trains stopped at stations should be protected by signals, so even the smallest one-platform station would have had at least a couple of signals worked by levers on the platform even if there was no siding or level-crossing to protect. It was relatively simple also to provide a set of block instruments at such locations, with the result that the S&DR had far more block posts without passing-loops than would have been the practice in later years. One infamous example of course was the signal-box at Foxcote, a block-post which had a siding but no passing-loop and was not situated at a station; this situation did not provide any danger by itself provided that the block working was operated correctly. The BoT's Report on the 1876 accident made great complaint about this arrangement, but seemingly more because the S&DJR had opened the box without BoT authority in contravention of their original undertaking on block working rather than because of any foreseen safety hazard. Certainly the BoT Report ignored the various other S&DJR locations where it is known that block-posts existed without passing-loops at that time (although most, but not all, were located at stations). Nevertheless the S&DJR abolished the block-post status of places such as Foxcote and Winsor Hill shortly thereafter. The provision of single-line passing loops, in the form of two platforms with both loop roads signalled for passenger train working, appears to have been fairly scant throughout the S&DR until the mid-1870s. On the ex-DCR line nothing is known about the early arrangements at Cole and the passing-loop at Wincanton was not installed until 1876. The situation in the Templecombe area is very confused prior to the doubling of the line to Wincanton in 1884, although there is believed to have been a passing-loop at the DCR station prior to the opening of the Templecombe Junction Railway in 1870. Passing loops were installed in 1878 at Stalbridge and Shillingstone. A new signal-box was inspected at Sturminster Newton in 1876, but it is not clear if the loop there had existed previously. Information is lacking on Bailey Gate, but it appears that a passing-loop may have existed prior to the opening of a new signal-box in 1879. Only at Blandford, where some new work was inspected in 1878, is it known that a loop had been in use for some time previously. Less is known about the ex-SCR part of the line. Loops and second platforms were provided in 1891 at Pylle and West Pennard, although in both cases it is believed that the loops had existed already as sidings and may well have been used for the passing of trains. There was a loop and two platforms at Glastonbury in 1878 when the extension of the Wells branch line was opened, but it is likely that the loop had been there for some time. The situation at Shapwick is unclear, although the passing-loop and first signal-box would appear to have been in use by 1900. Edington Road was merely a platform on the single-line until it became Edington Junction with the opening of the Bridgwater Railway in 1890, at which time it became a passing-loop with two platforms (with an additional bay platform for the Bridgwater trains). As the line is a single one, there is no positive necessity for crossing the rails, but as there are generally two lines at the stations, it would be desirable at some time to carry over at least the platforms of the more important stations, and to start the trains from opposite sides." "At each station there is a siding for the purpose, we suppose, of allowing trains to pass each other." However the S&DJR Officers Minutes for 21-October-1875 record a decision to "...extend to thirty wagons and engine and tender..." the loops at Wellow, Radstock, Midsomer Norton and Binegar. There is reference to a loop "south of the station" at Shepton Mallet and it was decided to provide a loop at Chilcompton (which was installed in 1876). In contrast the Officers' meeting of 8-November-1876 decided to take out of use the loop at Evercreech Village (later known as Evercreech New). It is important to note some features about the design and operation of the early passing-loops. The provision of signals tended to be limited to just Distant, Home and Starting signals in each direction and the liberal provision of ground signals was a thing of the future (for examples see signal diagrams for Chilcompton 1878 and Wellow 1886). One contemporary peculiarity which existed on the Bath Extension was that the starting signals were not interlocked with the distant signals, so that the latter merely acted as repeaters for the home signals, whereas in later practice a distant signal could not be cleared until all the stop signals in advance controlled from the same signal-box were 'off'. 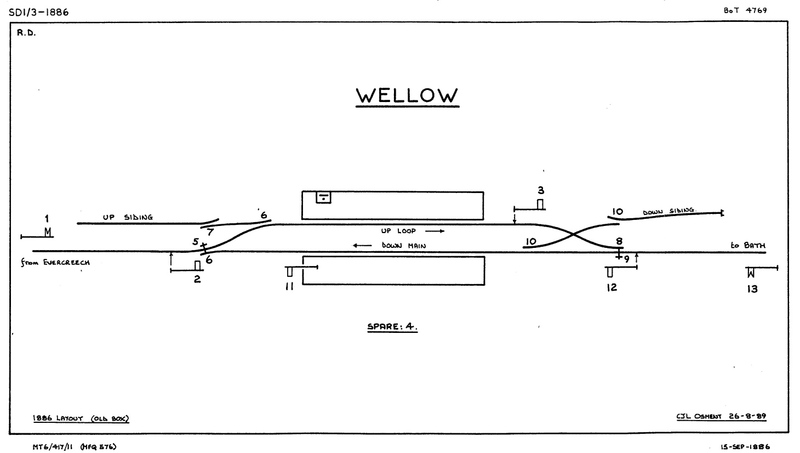 It is uncertain when the interlocking was updated at such locations, but certainly at Wellow the old arrangement still existed in 1886. The BoT set a limit of 100 yards for the mechanical operation of points, which was increased at various times (sometimes with differing limits for facing and trailing points) until eventually it reached a limit of 350 yards. This limit had the effect of restricting the length of a passing-loop that could be controlled from a single signal-box, particularly if for some reason (eg supervision of a level-crossing) the signal-box could not be placed at the mid-point of the loop. Consequently there were several loops on the S&DJR at which it was necessary to provide a ground-frame (GF) near one end, released by the signal-box, in order to work those points which were too far away. (As far as is known, in all such cases the release was mechanical by rodding between the signal-box and GF.) In some cases (eg Shillingstone) the GF was a later addition, necessitated by an extension of the original loop at some date after its original installation. Over the years these GFs were superseded as the extensions of the BoT operating limits allowed the points to worked directly from the signal-box, but some lasted for quite a while; the GF at the north end of Stalbridge was not abolished until 1955, when its points were converted to motor operation. A few words of caution are necessary about the interpretation of some of the information on S&DJR signalling which may be found in the course of research. Early signal diagrams tend to provide only basic information and may give rise to some confusion, as it is not unknown for signals to have been omitted from diagrams or for there to be contradictions in the locking-tables. (Even in the 1960s at least one diagram hung in an S&DJR signal-box contained an error.) In later years it was the practice to state on a diagram the names of the block-posts to which the signal-box worked on either side, but in earlier years it was common simply to give an indication of the direction (eg 'to Bath', 'from Evercreech' etc). Some drawings for new works circa-1876 show distant signals with square-ended arms; it is not known whether this indicates that the S&DJR had not yet adopted the 'V' notch in the end of distant arms, or merely that the draughtsman was unaware of the revised form of the signals that he had to draw. Some signal diagrams printed in recent publications may have been 'reconstructed' from unconfirmed evidence, in order that a reasonable indication could be given of the signalling at a particular location, and therefore may include items which actually had not existed concurrently. Similarly it is unfortunate that some authors have made inaccurate comments as a result of attempts to reconcile diagrams, plans and photographs from different periods without understanding the background to any apparent inconsistencies. It should be noted that there are various places in RailWest where, in the absence of definitive evidence, a 'reasoned opinion' had been provided in order to provide a better understanding of some issue, but hopefully all such instances have been highlighted as being distinct from actual fact.